Men increasingly wear separate jackets and trousers. It is an inevitable result of more casual office wear, and dressing down more generally. But separates are hard. Men are not used to combining them effectively, and although I see more nice jackets around – navy hopsack, pale-grey cashmere, tan cottons – the trousers are often problematic. Following a recent request from a reader for a guide to colours in separate trousers, here’s my top five. The most versatile trouser colour. Its paleness means it will be sufficiently different to almost any jacket. For those afraid of the possible nautical and/or 1980s connotations, avoid a navy blazer on top and go for grey cashmere, perhaps in a nice herringbone. Trousers could be in flannel, cotton or linen. Cotton chinos will be the most versatile. Grey flannel trousers should be a central part of every man’s wardrobe. Great with navy knitwear or jackets, and a range of other colours. As with any of these trousers, they can be given a youthful edge by being cut slimmer in the leg, and possibly given a deep turn-up (two inches or more). Pale grey (pictured top) just as good as mid-grey. Best in moleskin, and in that material extremely versatile as a pairing for navy, light grey or green on top. Can also work surprisingly well in flannel. See article on PA Crowe coming up. My favourite trouser colour at the moment. I have two pair, with my favourites from Elia Caliendo (pictures at all of these links, obviously). When nothing else seems to work on the lower half, go for charcoal. Nice in fresco, or a simple worsted twill (worsted being the finish on wool you get most commonly in suits). A bit of cashmere or a slightly more brushed finish avoids them looking like one half of a suit. For me, navy works best as a chino. If charcoal is the fallback option for formal trouser-separates, navy is the fallback for casual trousers. Mine are from Incotex (stocked at Trunk) and they are used once or twice a week. I have yet to find a navy wool trouser I like as a separate – it suffers the one-half-of-a-suit problem more than any other colour. Green can also work well if it’s dark enough; tan can be very versatile but the subtleties of the shade make all the difference; black should be avoided at all costs. Remember to have sufficient contrast between jacket and trouser, and if you’re in any doubt about wearing a suit jacket on its own, don’t. You can follow the discussion on Trouser colours to wear with odd jackets by entering your email address in the box below. You will then receive an email every time a new comment is added. These will also contain a link to a page where you can stop the alerts, and remove all of your related data from the site. Would love to see a photo of how William Abraham socks wear! Hi Simon – thank you for the recommendations. Related question: what pairs well with Blackwatch plaid trousers? Great post, and just what I need! I love the odd jacket, but I find the odd trouser path to be treacherous indeed. I have trouble finding good alternatives on the dressier side of things (flanells etc) — they often feel too much ‘old man’ to me, or like I could just as well have picked a suit (of the slightly rougher variety, admittedly). And so when I go for this type of trouser, I often skip the jacket altogether. One the other side of the spectrum, I have a personal aversion against the khaki pant, as well as many chino models coming dangerously close. Consequently, I find myself all too often sticking to jeans or corduroys. A trifle limiting, wouldn’t you agree. So keep the inspiration coming! this comment for me sums it up ideally. I recently purchased a pair of needlecord trousers from Ede & Ravenscroft in dark green. I loved the fabric, the weight and the colour but they were far too oldmanish due to the width of the leg. I took them to a local tailors (one that had worked with Ede in the past) and had the legs tapered down and shortened slightly. This simple change transformed the trouser and now they have a far younger and more tailored look about them. I’ve learned from this very blog that you shouldn’t be afraid to get things altered. There are different reasons to fear Alteration. 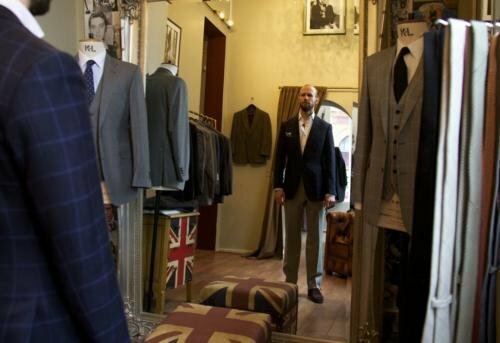 You are privileged to have a tailor you can trust, and even a tailor, as you say, who has worked with E&R. Your remark about the cut of the RTW needlecord trousers is quite valuable for me. 1. What is the difference between worsted, fresco (your G&H travel coat I guess) and serge? Are they all types of twill weaves? Worsted is a finish; fresco is a name for a particular weave and finish; serge is broader, can be woollen or worsted twill. Very , very informative article and a real gem when read along with “Reader question: Wearing odd jackets”. The two I found extremely useful in helping me establish a future ‘transferable’ wardrobe around jackets and trousers. I will truly use both articles as a foundation. More photos around both articles would be good. I think jackets and different trousers often gets around the too formal / not too casual problem. I notice you make no reference to black trousers and / or jeans (although I’m aware of your general dislike of the ‘jeans with everything ‘ look and your preference more so for chinos and flannels. I think a serious piece on jeans is long overdue ( I hear a lot about Japanese denim). Also do black trousers ever work ? Thanks. I will be doing more on denim soon. I think in addition there’s almost another article calling out to be written ,”Shirts / tops to wear with odd jackets “. Also as summer approaches your thoughts on summer T shirts (if I recall correctly I haven’t seen anything on this subject from you) or are T shirts a definite style no no ? Great advice as always Simon. First time commenting for me. Just out of curiosity, I see most photos of you are taken by Luke (lovely photos at that). How do you manage these at seemingly very spontaneous occasions? Does he travel around with you? Excellent, sir. I note you missed how the pinstripe jacket pairs well with tracksuit bottoms (from your 18 May 2012 post). That said, if anyone has justification to deviate from The Rules, it’s the man who literally wrote the book on dressing the man. Very conservative! Your photograph doesn’t show that shade of gray you mean very well. What hsppened to the other colours? Pink, lime green, fuchsia, etc.? Frog mouth pockets look very cool and frankly more beautiful than the verticals. But they are seldom found (by me) in RTW, unless Holland &Holland now £225. Beyond colours, any thoughts on using texture and patterns in trousers? I was thinking to get a pair of trousers made up in a yellow and brown birdseye, which from a distance looks like khaki. Can you expand on this, how do we pair in odd jackets and waistcoasts or cardigans? Please add my voice to Anonymous’s request. Cardigans, and in particular waistcoat cardigans, are a good way to extend the seasons that one can go out wearing an odd jacket without an overcoat coat and still be comfortably warm. I’ve been giving quite a bit of thought to waistcoat cardigans recently, hopefully now in preparation for the 2014 late autumn and early winter seasons rather than early spring since it’s tempting today to believe that summer is almost upon us in London. Waistcoats are beautiful, especially in silk. I always wear a waistcoat with my jacket. Do you consider your advice concerning “sufficient contrast between jacket and trouser” is useful for short men? Being vertically restricted myself, I prefer to avoid this contrast and manage with one colour or keep it to close colours in the palette. So if I’m 5 feet 7 inches and don’t want to draw attention to this fact I may be better off going for a suit in a casual colour or texture than a sport coat/ odd trouser ensemble? I wonder if you consider your advice concerning “sufficient contrast between jacket and trouser” is of use for short men. Being vertically restricted myself I always keep the palette restricted to just one colour. Hi Simon, thanks for the right article at the right time, as I’m currently looking for summer trousers. What would be your recommendation for spring-summer? The cream chinos I suppose, but like BespokeNYC I’m still hesitating a bit, and would rather get tobacco or navy chinos. Mid, or lighter grey frescos sound an interesting as well. Any other alternatives? I know you prefer black shoes for charcoal suits, but what do you wear with charcoal trousers? Very useful! One question if I may: what jackets do you find work best with the navy chinos? I am a big fans of your style. Something similar I want to develop on myself. I just spent time to read through your previous post to try to get some pocket square purchase because I always thing you wear them very nicely. I could not find the exact thing. Would you consider making a post sharing how to choose, which brand to consider, preferred material and size, color and pattern for harmony? It will be very much appreciated. Again, nice job on your outfit and blog! Congrat. Thanks Simon very helpful. I’m trying to expand beyond the dreaded demin and although I have two pairs of cords, tan and navy, would like to experiment with flannels, linens and others. Over the next couple of weeks I plan to invest in a good leather bag I can use for it every day. I need it to be fairly large (at least larger than a slimline briefcase), so it can fit in lunch and a water bottle as well as work stuff, and handheld rather than a shoulder bag so it doesn’t damage jackets and knitwear. I’m also thinking of brown, as my office is casual and I will almost always be wearing brown shoes so a black bag won’t match and will most likely look a little too formal. One is from Patrick Grant’s budget brand, the other is from Simon Carter. I think they’re both fairly clean and elegant. Unfortunately, they’re both quite bulky but this is the size I’m going to need if I want to carry all of my stuff in one bag. I’m just wondering if you have any thought/advice on my general line of thought and those two bags in particular? Any knowledge of those brands? No knowledge of those brands in particular I’m afraid, but then quality and suppliers with these brands can change frequently. Have you read the ‘Bags’ section of the site? It’s under accessories. In there you’ll find pieces on modern man-bags, buying on a budget, and my How to Spend It article that could perhaps help you learn how to assess the piece you picked out yourself. Thanks Simon, I’ve read all of the relevant articles. Guess I’ll have to go back and look at each one closer. I am also aware I said I’d show you my gloves from Jamrozinski. Will do this as soon as I’ve had the chance to photograph them. Do you know of a cloth book that has cream flannel? I’d like to make up a pair but can’t seem to find a book that has cream flannels. Thanks. But don’t ask Fox about lightweight flannel in jackets, because if you Dance and sweat, their expert will take for granted one knows Perspiration changes the flannel surface. Simon Hi. Blogs great help. Just moved into EC4. Any ideas for dry cleaning valet service etc… Used the usual but not that happy. What is the blue jacket that you’re wearing? It’s absolutely exquisite. The balance is fantastic on you. The height of the buttoning point, the degree of waist suppressions and the amount of the cutaway of the front quarters is, in my view, judged to absolute perfection. Since this is a trouser post I will mention that my quest for a relatively affordable supplier of casual trousers continues. I spoke to Cad & The Dandy on the phone yesterday to see what they might offer and was quite surprised. The price grid on their web site is for their basic MTM service but for only a £60 premium on a trouser-only order (compared to a £400 premium for a full suit) they will do the trousers at their full bespoke level i.e. complete with basted fitting which I wasn’t getting for trouser-only orders at Graham Brown and with a proper paper pattern cut. That’s a starting price of only £250 for the cheapest price band, i.e. with the cheapest cloths. They quoted me £340 for a Minnis flannel which still seems quite reasonable. Clearly the price uplift for going to their top-tier service is far less for a trousers-only order because the issue of going to a full canvass is not applicable for trousers and is what presumably accounts for a lot of the £400 uplift for a suit. I haven’t commissioned anything yet so I have no idea of quality but the price sounds right and I hear they have some good cutters, e.g. Jon deBoise, the older brother of Edwin deBoise from Steed. This sounds as if it could potentially be the perfect solution for me. Have you any experience of Cad & the Dandy? My investigation has revealed mostly good things about them although inevitably on the internet there’s always the odd negative comment. I’m definitely going to commission something in the next few weeks to see what sort of fit I can get. The jacket is from Thom Sweeney. Have a search and you’ll find the posts on it. Interesting on the trousers. I’ve heard mixed things about C&D, but that’s perhaps inevitable with somewhere that offers so many different levels of work. I have no experience myself. What nautical and 1980’s connonations does cream provoke to your mind? I as so many others greatly appreciate reading your articles, it has been great to discover your writings which address questions many out there are thinking but might not know where or how to raise. I am thinking of having my first odd jacket made and I really like the look of the dark blue one with the blue windowpane check shown at the top of the article. Apologies if you’ve shared details of this cloth previously but you mind doing so again please? As I would potentially like to commission a piece with this cloth. Thank you very much and look forward to reading future articles. It’s from the Caccioppoli winter jacketings bunch. I haven’t looked at that bunch for a while, and it may not be in there as it’s a few seasons ago, but that’s definitely a great one to check out. As a wearer of odd jackets and trousers, never a suit, I’d like to ask about the benefits of bespoke v off the peg for legwear. I’m taking delivery of my first bespoke sport jacket soon and thinking of ordering a couple of pairs of chinos to be made up when I collect and wondered if it’s really worth going the bespoke route with trousers that aren’t part of a suit? Looking at Incotex chinos the cost difference between those or bespoke from my tailor of choice is only a few pounds. I ordered RTW but will ask when I collect the jacket as well. What do you think about sharkskin odd trousers? In mid-grey,w ith a dry finish? Too suit-y? Hi Simon. I’m a bit late to this post, but I was wondering what jacket colors you wear with charcoal pants. I’m a big fan of charcoal pants, but the Internet consensus here in the States seems to be that they’re not very useful because (1) they’re too dark to pair with navy, and (2) they require lighter jackets, which for some reason are frowned upon. I’d love to hear your suggestions. Charcoal pants are great! One reason: navy pants are hard to wear on their own without looking like orphaned suit trousers, so charcoal is the only dark option. With respect to moleskin trousers, what’s the best way to pair them with a sports coat? Flannel, or something more casual, like herringbone or tweed? Have I overlooked mention of seersucker trousers here? What is your experience and feeling about seersucker, Simon? Thank you. Do you disfavour seersucker as trouser cloth because of its rolled surface, which you find for trouser ugly? Is your judgment because seersucker fails to fulfill criteria for trouser cloth, or because because seersucker has attributes which disqualify it? PS: You accept seersucker suit, so it must be the relationship of non-seersucker odd jacket to seersucker trouser somehow? OK, if that’s your feeling, I’ll respect it. But for me to changr my intention to buy two pairs of seersucker trousers on sale your feeling is not enough. I’m not 100% sure this is the right post to ask this question in, but I’m wondering if it’s correct to wear light grey trousers that have a pale blue pinstripe, with a navy blue suit jacket? I’m a woman and I don’t work in a corporate office so I know I have more leeway than the very traditional male suit options, but I don’t want to look like I just threw on whatever I found first. The jacket is slightly heavier weight than the trousers, I’d be happy wearing them together if the trousers were solid grey, my only real query is wearing a pinstripe piece with a solid colour piece. Thanks in advance! Just spotted your comment on not being able to find a good navy wool for trousers. I have a pair made from a VBC hopsack, which has plenty of texture and which screams “informal”. They work well with anything from Harris Tweed in all its shades, to a plain white shirt and charcoal sweater. Any thoughts on what fabric of grey odd pants works with a navy linen jacket? I think brownish jackets can look okay with grey bottoms. If one peruses the web and the photo-rich texts we all know, this is frequently depicted. My tailor has always told me this is not good. I remember a woman at work actually telling me my grey trousers looked bad with a gun club jacket. Why do some people like this combo and others think it is a no-no? Recently I had made a DB corduroy jacket, same color as your corduroy suit. What kind and color of pants would you choose to combine with the jacket? For the dark green: what kind of cloth. Would you disadvise against dark green corduroy? I’ve been struggling in finding the right trouser colour and material to pair with my odd slatey grey cord jacket…..
charcoal worsted trouser? Navy/ beige chino? Thanks for this article! It is helpful! I have a desert sand color suit made in wool/linen/silk. Can you give me some advise to pair this kind of jacket? Which color and material of trousers are suitable for this jacket? Thank you! I’m considering a purchase for my first double breasted jacket (https://thearmoury.com/products/ring-jacket-wool-balloon-amj06-sport-coat?variant=37895984399). Considering I’m only going to wear it in casual holiday settings (but for colder climate), what are your thoughts about pairing this with more casual trousers (jeans and armoury army chinos etc.)? It’s a lovely jacket, but I don’t think it would be easy to wear with such casual trousers – largely because of it’s formal colour and because it’s a DB. I’m a lot late on this post but I have a question about moleskin trousers. I like the idea of brown moleskin but how should they be styled? Flat front w/ no turnup? Seems like I might as well be wearing chinos at that point. Thanks for your time and your insights. Thanks Simon! I really appreciate how much time you give to us. I have one other question. I’m wondering what brands you might recommend for RTW trousers. I am in the market for grey flannels right now and Nashville does not have any good bespoke tailors that I am aware of. I have ordered from luxire and the trouser from them is good but not good enough for five pairs if you know what I mean. I’m afraid it’s hard to recommend RTW brands for things like this Don – because they change from season to season these days, both in terms of styles offered and sometimes quality as well, and because I don’t really know what’s available in physical stores there. Taking your advice and planning some bespoke chinos but unclear on weight. For example, in the Bay Area in California, would a Dugdale 310g cotton twill be considered a 3 season fabric (excluding winter)? How much wrinkling should I expect? I think so yes, though I have never lived there so hard to say precisely. You will get a fair bit of wrinkling. Thanks for your input. I guess only winter weight cotton will have less wrinkling but won’t be wearable in 70-80 and even 90s. Hey Simon, how versatile is a pair of dark brown crispaire as an odd trouser? Asking from the context of a wearing them with dress/oxford shirts, open necked, without a jacket. For a pair of odd brown moleskin trousers would you recommend going with pleats and turn-ups or isn’t that fabric suitable to do turn-ups on?